The Laser Hole Boring System is a high-performance drill system designed for use in a variety of materials, from aluminum to super alloys. Made from the finest heat-treated steel, the drill body's rigid insert nest and straight flutes promote long insert life and facilitate efficient chip removal. Positive geometry greatly reduces stress imparted into the workpiece, thereby diminishing strain on your machine tool. Inserts are not a general purpose turning insert, but a grade of carbide specially formulated to withstand the extreme pressures of drilling. On the market for over ten years, this system can reduce manufacturing time radically. Drilling time can be measured in seconds instead of minutes, and at a fraction of the cost. 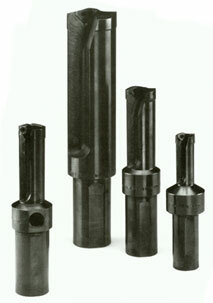 A total of eight inserts provide the entire inventory for Laser's eighteen-piece drill system. Individual drills start at an unbelievably low price and are being sold through a network of independent distributors.